How Can You Fly Inside An Inside-Out World? I'm not entirely sure, to be honest, but InnerSpace sure looks pretty. "Set in a world where physics are inverted, the player flies in a spherical world surrounded by water, where gravity falls away from the center. Take the role of an unnamed cartographer to explore the various bubble-worlds, collect relics, and encounter each bubble's mythical demigod, in order to discover more about the universe, its history, and its future." The goal is for InnerSpace to be truly open and exploration-focused—no scripted missions smashing against your cockpit window like especially gut-stuffed flies. No interruptions. Just you and the sky. Er, ground, maybe? I'm not sure what you call things when the world is inside-out. There will, however, be encounters with "powerful creatures tied closely to the worlds they inhabit." In that respect PolyKnight cites Shadow of the Colossus as one of its main sources of inspiration, in addition to exploration-focused games like Proteus and Minecraft. Also the sadly underrated Crimson Skies, because planes. Flying, meanwhile, might look typical enough, but that whole inside-out planet thing makes it all topsy-turvy. 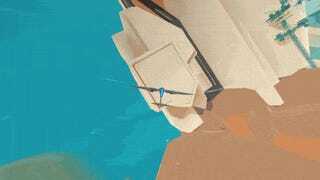 "Since the world disregards our own world's physics, the plane flies free from the rules of gravity, which allows you to focus on the experience of exploring, instead of worrying about staying upright," wrote the game's creators. You can also fly underwater, something that is rarely good for real planes. InnerSpace is currently on Kickstarter. Do you have $25,000? I don't, and neither does PolyKnight. They'd like to have that much, though (and so would I). They've made a solid chunk of it already, so that's a good sign. What do you think? Is this one worthy of your precious backer bucks? Or are you gonna save them for some other languidly flowing flight game set on an inside-out planet with battles inspired by Shadow of the Colossus?